*Actual On Road Price of Suzuki Intruder at the dealership may vary. Suzuki Motorcycles India has entered the 150 cc cruiser motorcycle segment in India by launching the Intruder and has priced it at Rs 98,340 (ex-showroom Delhi). Not to be mistaken with the Intruder M1800, which is a 1,800 cc behemoth, this one is a 155 cc model, which uses the same engine and underpinnings as the highly popular Suzuki Gixxer. The Intruder, no doubt, has been inspired by the bigger Intruder M 1800. The Suzuki boffins have tried to create the same bulky look as the Intruder's bigger sibling. The looks can divide opinion, but like it or not, you cannot ignore it for sure. 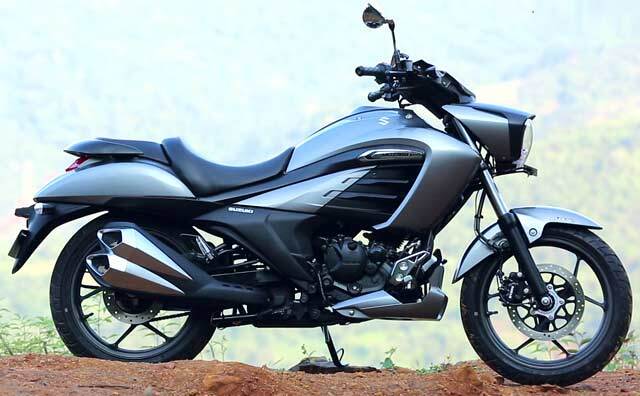 Suzuki Motorcycles India's research says that there is pretty good demand for affordable 150 cc cruisers and hence, the Intruder saw the light of the day. As we mentioned earlier, the underpinnings of the Intruder have been borrowed from the Gixxer, but Suzuki says that the bike, in essence, is all-new. The 155cc, singe-cylinder engine is carburetted, for now, and remains the same as the Gixxer. It makes 14.59 bhp at 8,000 rpm and 14 Nm of peak torque at 6,000 rpm. There are a few underlying changes though. The gear ratios are different and the intake and the air box are bigger in size when compared to the Gixxer. The exhaust too is a different unit than that of the Gixxer. Thanks to the body panels and the changes in the engine, the Intruder weighs 8 kg more than the Gixxer at 148 kg. The claimed fuel efficiency figure for the Intruder is 44 kmpl. Suzuki Motorcycle India will soon launch a fuel injected version of the newly launched Intruder cruiser. The bike is expected to be launched in India during the upcoming 2018 Auto Expo. As per the specs and the features with which his bike is loaded is gr8. But suzuki should have launched 200cc and above variant as well. Large market in India are going towards 200cc bikes. Not worth for the price : should build high CC bikes. which has more demand.